We see that you liked the concept so much that we just could not leave it alone. My Blog V2 is updated version of our blog Joomla Template My Blog but with beautifull grunge style that will leave you wondering. Is this Joomla or Wordpress? It is Joomla alright but with a special layout and features that will give you complete blog freedom and let you enjoy this outstanding Joomla theme. 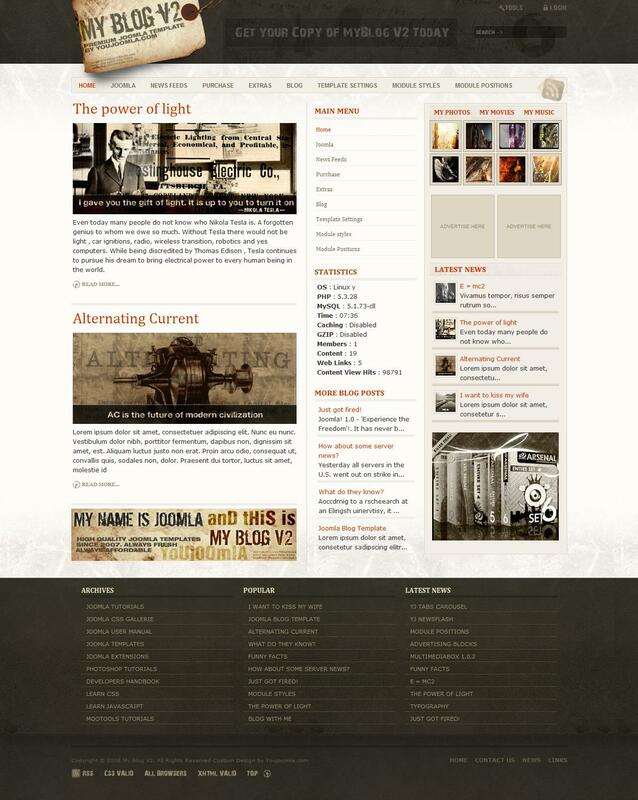 With its unique layout and style My Blog V2 will fast become your favorite template in our portfolio. Including with Youjoomla standard features and enhanced typography this template is just waiting for your Joomla installation. Premium template YJ My Blog v2 for Joomla 1.5 perfectly emphasize your individuality to create a personal blog site. The template implemented two unique visual style and 15 module positions.